Radio antennas stand sentinel at the Allen Telescope Array, north of San Francisco. 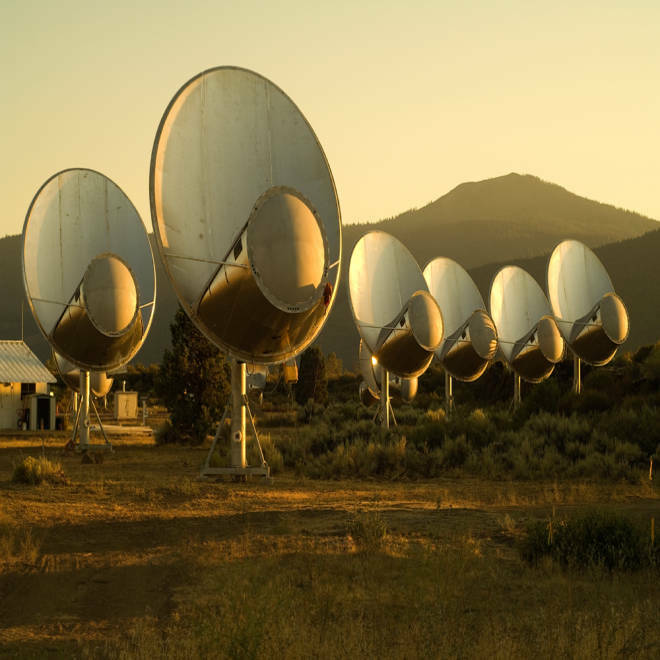 The SETI Institute's search for extraterrestrial intelligence is back on track, thanks to more than $200,000 in donations from thousands of fans. "We're not completely out of the woods yet, but everybody's smiling here," the institute's chief executive officer, Tom Pierson, told me today. In April, the institute had to put its big ear for hearing E.T. 's radio call, the 42-antenna Allen Telescope Array in Northern California, into "hibernation" due to budget woes. The biggest hit was the loss of funding by the University of California at Berkeley, the institute's partner for operating the antenna array. The SETI Institute has been around for decades: It stepped in to help keep the search for alien radio signals active after NASA cut off funding for the quest in 1993. It's not the only organization doing SETI, but it's the leader in the field. The Allen Telescope Array, or ATA, was launched with $50 million in contributions from software billionaire Paul Allen and others — and if the array ever takes in 350 linked antennas, as it's designed to do, it would rank among the world's premier radio-telescope facilities. But in light of the financial challenges, that's a huge "if" right now. In fact, until last week it wasn't certain if or when the ATA would come back online. Among the contributors are Jodie Foster, the actress who played a SETI researcher in the movie "Contact"; science-fiction writer Larry Niven, creator of the "Ringworld" series of novels; and Apollo 8 astronaut Bill Anders, who flew around the moon in 1968. "It is absolutely irresponsible of the human race not to be searching for evidence of extraterrestrial intelligence," Anders wrote in a note accompanying his contribution. Pierson said the institute's managers and scientists were drawing up a plan that would restart science operations in September. "We think we're going to come out of hibernation and be solid for the next five months or so, and during those five months we're going to take care of calendar year 2013 and put that under our belt," he said. Pierson acknowledged that the ATA's long-term success would "require a mix of funding," including continued contributions as well as renewed cash flow from other applications for the radio array. The institute is hoping that the U.S. Air Force will use the array to track orbital objects that otherwise might pose a threat to the International Space Station and other satellites. During the daytime, the ATA could be used for the Air Force's "debris deconfliction," and during the night it could search for alien signals, Pierson said. The institute is also looking for ways to reduce the array's operating costs from the current level of $1.5 million per year, plus another $1 million for science operations, Pierson said. "We need to transition to a new modality without UC-Berkeley," he said. Eventually, astronomers at the SETI Institute hope to use the ATA to listen for signals from the most promising planetary systems identified by NASA's Kepler planet-hunting mission. Jill Tarter, the institute's director of SETI research, said in April that the fund-raising target for the Kepler follow-up project would be $5 million. The institute has already set up a website called setiQuest, where citizen scientists can help sift through the data expected from the ATA, and SETIstars will remain open to receive donations, Pierson said. He had two messages for the SETI supporters: "No. 1 is how grateful we are," he told me. "More than 2,000 people jumped in and help. Also, stand by for future campaigns from SETIstars. We hope to build opportunities that will really excite the public." Calculate the odds of finding E.T. Gallery: 50 years of searching for E.T.